1. No laser processing of acrylic smells, but was complained about environmental issues by our die sawing machine. 2. There is no laser processing of acrylic die to produce poison gas, which affects the surrounding environment die sawing machine. 3. No acrylic laser knife die is easy to rust die sawing machine. 4. No laser acrylic generates harmful gas corrosion machine problems die sawing machine. 5. 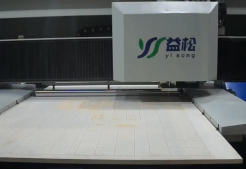 There is no laser machining acrylic effect, which greatly shortens the service life of the machine die sawing machine.